When the Slovak Foreign Minister refused to sign the controversial "conscience concordat", the Christian Democrats pulled out of the coalition and the government fell. The appendix gives thirteen contemporary accounts from Slovakia and abroad. Early in 2006 the unprecedented “conscience concordat” with Slovakia was ready for signing. The Vatican had negotiated it with Daniel Lipšic, the Justice Minister in the coalition government who belonged to the Vatican-friendly KDH. Prime Minister Mikuláš Dzurinda said that Lipšic had no cabinet authority to negotiate the terms of the treaty with the Vatican and that Foreign Minister Eduard Kukan, a senior member of his own party, the SDKÚ, should have been the one to hold the talks. Indeed, it is the job of a foreign minister to oversee the negotiation of treaties and the Vatican assigns this task to its own foreign minister, the Secretary for Relations with States. The governing coaltion in Slovakia was precarious. Opinion polls showed that Prime Minister Dzurinda's SDKÚ would lose badly if an election were called early in 2006. However, this is what his coalition partner, the Catholic KDH threatened him with if his party didn't sign the concordat. It was a familiar scenario: a government put under intense political pressure to bring in a concordat. Then something unprecedented happened. Experts in human rights law from the European Union reported their concerns about the treaty. Those who opposed the concordat no longer felt alone in their struggle against the most powerful institution in the country. They could cite the independent European human rights lawyers. Furthermore, the EU experts' critical report came less than two years after Slovakia's accession to the European Union, and it would be embarassing to have to face a challenge this soon. Even the Vatican admitted privately that the report had “played a key role in solidifying opposition to the treaty”. In early February Kukan, the Foreign Minister who had been bypassed in the negotiations, refused to sign the draft treaty, which prevented it from going before the cabinet for a vote. The KDH then carried out its threat to leave the coalition and made the government fall. Since then, Kukan, who upheld EU values by scuttling the concordat, has gone on to serve as a Slovak member of the European parliament. The following thirteen newspaper articles were published in Slovakia and abroad during the six weeks when the crisis was brewing. Even their headlines alone cast doubt on the truth of this Jesuit claim. The conscientious objectors' treaty that Slovakia is set to sign with the Vatican might clash with the EU's principles of freedom, democracy and respect for human rights, a group of independent legal experts established by the EU has concluded. The EU asked the group for their view of the treaty after it caused a dispute in the European Parliament, reported the SME daily. At the beginning of last summer, MEPs from their parliament's committee for civic freedoms sent a letter to Slovak Prime Minister Mikuláš Dzurinda expressing concern that the treaty might discriminate against non-believers. Under the terms of the treaty, medical and educational professionals, among others, would be allowed to refuse to perform a professional task if it violated their religious beliefs. The experts said that the treaty posed the greatest threat to abortion. Because in Slovakia around 70 percent of people claim to be Catholic, they argued, there is "a risk that the rights of conscientious objectors in the area of reproductive health could make abortions and related advisory services inaccessible for women, especially in rural areas". Slovak Justice Minister Daniel Lipšic, however, said that the duty of medical "conscientious objectors" to inform women of other doctors who carry out abortions could be defined in a separate law, and that it was unnecessary to incorporate this clause directly into the Vatican Treaty. Foreign Minister and SDKU member Eduard Kukan is refusing to sign a treaty between Slovakia and the Vatican on conscientious objection. Prime Minister Mikulas Dzurinda's SDKU party will have to explain the reason for this refusal to its coalition partner the Christian Democrats. The Christian Democratic Movement is said to regard this treaty as a burning issue for the party and for Slovakia. On the other side, SDKU considers it to be a very difficult issue for liberal voters, and would prefer to delay the decision until after the September election. Then it could be approved by a new government and parliament. The governing-coalition SDKU party intends to set out its position on the treaty on conscientious objection between Slovakia and the Vatican, and on the treaty on conscientious objection with other churches, following its presidium session on Monday. The tension surrounding the treaties was increased on Saturday. SDKU's coalition partner - the Christian Democrats - announced that the party will leave the governing Coalition unless the Government approves the two treaties at its upcoming session on Wednesday. According to governing coalition ethnic-Hungarian SMK party chairman Bela Bugar, SMK ministers will probably support both treaties. ANO caucus head Lubomir Lintner will not recommend that his two ministers support the treaties on Wednesday. Ruling SDKU party and its coalition partner the Christian Democrats are deeply split in their approach to adopting a Vatican-Slovakia treaty on conscientious objection, reports Sme daily. Prime Minister Mikulas Dzurinda faces a crash with the leader of the Christian Democrats Pavol Hrusovsky because SDKU member Foreign Minister Kukan is refusing to sign a treaty between Slovakia and the Vatican. Both politicians, Kukan and Dzurinda, claim they have a serious problem with some of the parts of the treaty. Before adopting a Vatican-Slovakia treaty on conscientious objection, Slovakia's Premier and SDKU chair Mikulas Dzurinda would like it to be acceptable not only for followers of one church but also other churches' believers and irreligious citizens. "We have a serious problem with some of the parts of the treaty," Dzurinda stated on Thursday. He added that he had told this bishop Rudolf Balaz during their meeting. The content of the special treaty between Slovakia and the Holy See on the right to use conscientious objection has been prepared by the Justice Ministry based on treaty adopted with the Vatican. In this so-called basic treaty, Slovakia has undertaken to have a special treaty on conscientious objection that will allow professionals to opt out of tasks that run counter to their religious beliefs. Premier Dzurinda entrusted Deputy Premier for Legislation and Justice Minister Daniel Lipsic to draught the text. The Government's Legislative Council approved it in spring 2005 and now it is ready for Cabinet discussion. The coalition party, Christian Democrats, regard the 'Vatican treaty' as its top priority. According to leader of their caucus, it is even possible that the Christian Democrats will leave coalition if the Government doesn't discuss the treaty. Political analyst Samuel Abraham admits that they could make such a "radical move" within their election campaign. General elections are approaching and even if the government falls the election will be held in scheduled term - in September this year, Abraham added. On the other hand, analysts also speculate whether the standpoint of the SDKU to make additional changes to the document is not a pre – election tactic to attract more liberally thinking voters. The two coalition parties are set to meet over the weekend and discuss the issue. PRIME Minister Mikulá¹ Dzurinda, the boss of the ruling coalition Slovak Democratic and Christian Union (SDKÚ), faces one of the most important decisions of his political career. Dzurinda must either approve the passage of the conscientious objector's treaty between Slovakia and the Vatican, or risk the collapse of his coalition government, the daily SME reported. The ruling coalition Christian Democratic Party (KDH) said on February 4 that it would leave the government unless the cabinet approved the treaty at its next session. "We're not putting any pressure on them, this is our free choice," said Pavol Hru¹ovský, the chairman of the KDH. Hru¹ovský argued that the government had made passage of the treaty part of its programme back in 2002, and that the KDH was now only insisting that its partners keep their promises. Among other things, the treaty would allow doctors to refuse to perform abortions if it violated their beliefs. The SDKÚ was expected to take a decision after today's meeting of its executive board. According to Béla Bugár, chairman of the governing Hungarian Coalition Party (SMK), his party will likely support the Vatican treaty, but the decision on the government's fate is the SDKÚ's to make, the TASR news wire wrote. The SMK and the KDH have seven seats in the cabinet, short of the majority they need to force the treaty through. THE MAIN topics on the agenda at the national congress of the New Citizen's Alliance (ANO) party in Banská Bystrica on January 29 were the current political situation in Slovakia and the party's election priorities. "ANO rejects the Vatican's agreements, it prefers to enable prenuptial agreements and an act on registered partnerships. We're convinced that modern society means the Internet and compulsory English instead of compulsory religious education," ANO leader Pavol Rusko said at a news conference following the congress. Slovakia's reforming rightwing coalition collapsed yesterday leaving Mikulas Dzurinda, prime minister, battling to avoid early elections. Yesterday's defection of the Christian Democrats is likely to force Mr Dzurinda to rely on the backing of authoritarian isolationist Vladimir Meciar in parliament to stay in government. But even if he holds on to power until elections scheduled for September, he looks to have little chance of winning a third term and continuing his internationally acclaimed reform drive. According to opinion polls Robert Fico, leader of the leftwing Smer party, would win 37 per cent of the vote if elections were held now, while Mr Dzurinda's SDKU would win only 11 per cent. The Christian Democrats, one of the three remaining parties in the coalition, announced last night that they were pulling out of the government because Mr Dzurinda yesterday refused to approve a treaty with the Vatican. Mr Dzurinda, central Europe's longest-serving premier, has already lost one coalition partner, the liberal Ano party, last year. His last remaining ally, the ethnic Slovak Hungarian Coalition, was waiting until today's emergency coalition meeting before deciding whether to stay. "If the Christian Democrats switch to fierce opposition, Slovakia will face a constitutional crisis," said Bela Bugar, the Hungarian leader, last night. The latest defection leaves Mr Dzurinda with just 53 deputies in the 150-member lower chamber, though he has already been offered backing by Mr Meciar, who led Slovakia into international isolation until he was defeated by Mr Dzurinda at the 1998 election. With Mr Meciar's help, Mr Dzurinda is likely to be able to hold on until the scheduled elections in September, but his chances of being re-elected for a third term have been gravely damaged. Mr Fico has already been making overtures to the Christian Democrats and the Hungarians and with their support he would have a clear majority. Mr Fico has pledged to reverse some of Mr Dzurinda's reforms such as the flat 19 per cent income tax, making patients pay more for health treatment and plans to introduce student fees. Under the Vatican Treaty, employees in strongly Catholic Slovakia would be allowed to refuse to work if it conflicted with their beliefs. Doctors could refuse to perform abortions, teachers could refuse to teach evolution and people would be allowed to refuse to work on Sunday if it was against their religious beliefs. "The text of the treaty is not good," Mr Dzurinda said yesterday. "Implementing this treaty would embroil the Catholic church into Slovak secular affairs." Bratislava - A dispute over a Vatican treaty triggered Monday's [6 February 2006] collapse of Slovakia's right-wing coalition government, raising the likelihood of early voting before the next scheduled parliamentary elections in September. The Christian Democrats (KDH) made good on their threat to leave the four-party minority governing coalition led by Prime Minister Mikulas Dzurinda and his Slovak Democratic and Christian Union (SDKU) party. As a result, Dzurinda's coalition lost 15 parliament seats and was reduced to three parties: SDKU, the Hungarian Coalition (SMK) and the New Citizens Alliance (ANO). The collapse gave more clout in parliament to left-wing opposition parties and their independent allies, including coalition rivals who want early elections. Last week, Dzurinda said that he had 'a serious problem with some of the parts of the treaty,' and SDKU Foreign Minister Edvard Kukan recommended against signing the document. SDKU opposes the treaty's so-called 'conscientious objector' status on grounds that it would favour Catholics over members of other religions. KDH member Lipsic had negotiated the treaty last year with the Vatican, despite Dzurinda's argument that the entire government should participate in the treaty process. Signing a Vatican agreement has been a top priority for KDH, which has close ties to Slovakia's Catholic Church. About 60 per cent of Slovaks are Catholic. THE RULING coalition is falling apart. The conservative Christian Democratic Movement (KDH) announced on February 6 that it was leaving the coalition because one of its main political partners, PM Mikuláš Dzurinda's Slovak Democratic and Christian Union (SDKÚ), was blocking approval of one of its main political goals - an Objection of Conscience Treaty with the Vatican. Foreign Minister Eduard Kukan, a senior member of the SDKÚ, has refused to sign the draft treaty, preventing it from going before the cabinet for a vote. While both parties have accused each other of dealing in bad faith, the underlying cause of the dispute is seen as a competition for the right side of the political spectrum in the run-up to scheduled September elections. The KDH appeals to an older, more conservative voter base, while the SDKÚ has increasingly taken neo-liberal positions on economic reform and social policy. The KDH had declared on February 4 that if the government did not approve the draft treaty, it would leave the coalition, the SME daily wrote. According to Dzurinda, however, the KDH is using the treaty as a pretext to leave the government. Dzurinda said that Justice Minister Daniel Lipšic, a member of the KDH, had had no cabinet authority to negotiate the terms of the treaty with the Vatican. Instead, according to the SDKÚ, Kukan should have been the one to hold the talks. The KDH is expected to announce its further plans at a press conference this morning. Even if the party were to pull out of the government, however, it would not necessarily mean the end of the Dzurinda coalition, as the main opposition party - Vladimír Meciar's Movement for a Democratic Slovakia (HZDS) - has said early elections are out of the question. Other opposition parties, including the Communist Party, the Free Forum and Smer, have refused to help the Dzurinda government complete its regular election term. On Monday the Christian Democrats â€“ the KDH announced that they were pulling out of the Coalition over the SDKU's refusal to approve the latest treaty on conscientious objection with the Vatican.. The Justice Ministry broke the rules on international treaties when it drafted the treaty on conscientious objection, said Foreign Affairs Minister Eduard Kukan, explaining why he refused to sign the treaty with the Vatican on conscientious objection. The treaty needed Kukan's signature to be discussed in government. Kukan also criticised the Daniel Lipsic-led justice ministry for discussing the treaty with the Vatican before doing so with the relevant ministries, and that the justice ministry had not been officially designated to draft the treaty. A basic agreement between Slovakia and the Vatican was approved in November 2000 by 100 MPs out of the 113 present in Parliament. Justice Minister Daniel Lipsic (the Christian Democrats - KDH) has repeatedly referred to this agreement during the current dispute between KDH and SDKU, Sme daily reports. Lipsic claims that the basic agreement can't be criticised, although it is possible to make changes to it, or scrap it if both sides agree. "If the treaty between Slovakia and the Vatican didn't cause a problem in 2000, why is it causing problems in 2006?," asked Lipsic. According to him, even the basic agreement guarantees the right to conscientious objection based on the principles of the Roman Catholic church. The fact is, however, that even the basic treaty sparked debates and arguments, which meant that some of its chapters, especially those concerning the funding of churches, and those dealing with conscientious objection, had to be removed. These chapters later turned into partial treaties - and caused the current government crisis when SDKU refused to approve them. The conflict-ridden Slovak coalition is set to fall after the Christian Democratic Movement announced that it is leaving the government. The government of Slovak Prime Minister Mikuláš Dzurinda has weathered several crises but is now facing another major crisis that could bring it down, reports EurActiv Slovakia. The last one, in the summer of 2005, ended with the liberal ANO party, headed by Minister of Economy Pavol Rusko, leaving the government. Dzurinda survived that crisis with the help of independent MPs and the MPs who formed a splinter group emerging out of ANO. On 6 February, the head of the Christian Democratic Movement (KDH) announced that his party was leaving government. This time the bone of contention was the Treaty with the Holy Sea. The treaty aims to set the ground rules for Slovakia's relations with the Vatican and would commit the country to respect the rights of the country's estimated 60% Catholic population. Critics say that it is not clear enough and would give too much room for interpretation that could lead to “unfair privileges” for Catholics. The Christian Democrats demanded the treaty's immediate approval by government so that it could be voted on in parliament before the scheduled September elections. 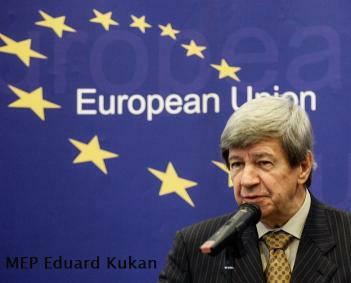 But Foreign Minister Eduard Kukan (SDKU), supported by his party boss Dzurinda, was against the move. They were against hasty approval and ratification, demanding further work on the treaty. The other coalition partners were also divided. The Hungarian minority party supported the Christian Democrats and the ministers previously belonging to the liberal ANO party were also against the treaty in its current form. The future of the Slovak government is now unclear as it has lost its majority in parliament. The opposition SMER (Social Democrats) and the Communists are demanding early elections while the HZDS (the party of ex-PM Vladimír Meciar) has yet to formulate a clear position. Prime Minister Dzurinda went to his coalition partners and secured their approval for early elections. He will now put the same proposal to a meeting of all the parties represented in parliament on 9 February. The Slovakian Parliament's ruling coalition has split following a controversy over whether or not to ratify a treaty with the Vatican. The treaty would guarantee that Catholic medical professionals not be required to provides services which violate their consciences, particularly abortion. The treaty was highly criticized by a European Union committee of experts which issued an opinion saying that the right to have an abortion may outweigh the right of a doctor not to perform an abortion. On Monday, the Christian Democratic Movement (KDH), one of the main partners in Slovakia's ruling coalition, walked out of the government after Prime Minister Mikulas Dzurinda refused to allow a vote to ratify the Vatican treaty. As a result parliamentary elections originally scheduled for September will likely be moved up to June so that a new government can be selected. Dzurinda, a member of the Christian Democratic Union (SDKU), has led a center-right coalition of four parties all of which advocate socially conservative positions, free market economic policies or a combination of both. Dzurinda and the SDKU are thought to support ratification of the treaty but are likely resisting a vote because they believe they do not have enough votes to pass it because of opposition from the libertarian elements of their coalition. A source inside the Vatican told the Friday Fax that the opinion of the EU's Network of Independent Experts on Fundamental Rights which assailed the treaty played a key role in solidifying opposition to the treaty. Peter Zelenak, the Political Counselor at the Slovak Embassy in Washington, told the Friday Fax that while he did not believe the EU opinion played a major role in preventing a vote on the treaty he did say the opinion "was there [and] it was on the table," "it was published in Slovakia," and at least some people cited it as reason to oppose the treaty. Prior to Monday's walkout Dzurinda proposed returning to negotiations with the Vatican in order to change the treaty to make it easier to pass. The KDH Party said such a compromise was unacceptable and walked out of the ruling government. See also Catholics for Choice, Slovak government falls over concordat with the Vatican.